It's been awhile. I've been meaning to write about this for some time, but finally got the utterly unavoidable urge to write this week, and couldn't put it off any longer. Also, I finally had time to read my friend BZ's blog and it inspired me to try to write a little something. My fears about blogging are that it's (1) egocentric, (2) boring to read, and (3) ultimately leads to an unfettered gushing of personal snippets from one's life onto the Internet for all to see. None of those things really appeal to me, so I shall try to avoid them. Let me know if I screw up, okay? Good. Now, then. I've been talking to a lot of people about Brazil since I got back. I universally acknowlege that it was awesome, and once even went so far as to call it "life-changing." Why, you ask? Here's why. In short, in going to Brazil to travel around alone for two weeks in a country where I didn't speak the language, I did something I never thought I would do, and never thought I could do. I found the experience to be utterly exhilarating and intensely liberating. I often--often!--found myself happily semi-lost (shh...don't tell the grandmas! ), using some combination of broken Spanish and sign language to speak to Brazilians around me. I got to use parts of my brain that I didn't know I had, and was forced to use all of my senses, again and again and again. Sight, smell, taste, hearing... Being constantly bombarded by new things. Doesn't that sound fantastic? It was! I don't know that none of this would have happened if I had been traveling with other people, but I can't help but suspect that the experience would have somehow been diluted if I had had a fellow English-speaker with me. I certainly would not have been mistaken for a Brazilian (as I was, at least twice) if I had been traveling with someone else. I wonder if that's what it's like to be a baby or young child. It's like I could feel new connections being built in my brain, in a way that's been utterly foreign to me for...awhile. To explicate further: It was exhilarating and liberating. 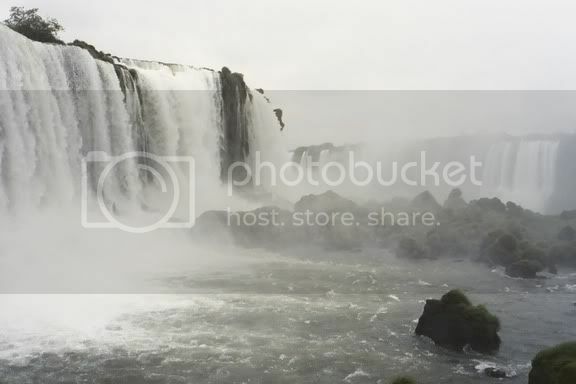 It was exhilarating to see so much gorgeous beauty in nature, mostly at Foz do Iguacu. The animals, the plants, and the waterfalls (especially the waterfalls!) were fantastic and utterly breath-taking. I really didn't know anything could be that stunning. It was also an intensely humbling experience. I felt so little... One of the photos, I think, shows another thing that the waterfalls stirred in me. There was something primordial, something otherworldly, something second-and-third-day-of-biblical-creation, something Genesis-y about the waterfalls, about their power, about looking out into the water and seeing no living thing. I don't think much about being witness to creation, but in a way, I felt like I was, there, standing over a waterfall. Watching the waters rushing down around me, I felt grateful, for the first time in my life, that God thought to separate the waters above from the waters below. The firmament--what a great idea! And the liberating part? It's liberating to be somewhere entirely different from where you've been before, where nobody knows you. I can't exactly explain it, but it made me understand why some people pick up and move to new places. I was happy to be able to feel that liberation in a constrained time period, though. I would have thought you'd have to change a LOT more about your life to feel the liberation I felt in Brazil. And in case you did not read the play-by-play accounts of my trip from previous posts, let me assure you that I did nothing unlike me, nothing out-of-the-ordinary, nothing I wouldn't do in New York City (if New York had gorgeous beaches, stunning waterfalls, and enormous statues of Jesus). It was just being somewhere else that liberated me. Who woulda thunk it? I guess that's it. I want to blog more, but am not sure what about. Ideas, anyone? I want to get back into writing, and figure that this may be as good a forum as any. It's a great way to get back into writing. And the beauty of the blog is that it's all yours. Like having your own magazine. What would you want to read and write about? Write what you want, and you'll find your audience. Best of luck, thanks for the links, and stop by sometime soon! Is it not cool to comment on your own blog? Probably not.